High tensile steel threaded rod system for tying wall forms etc. together. Consisting of a course, rounded thread for speed of use and easy cleaning. Large wing nuts, plate washers, spacer tubes and polythene cones. allows the rods to be completely removed from the wall and re-used many times. 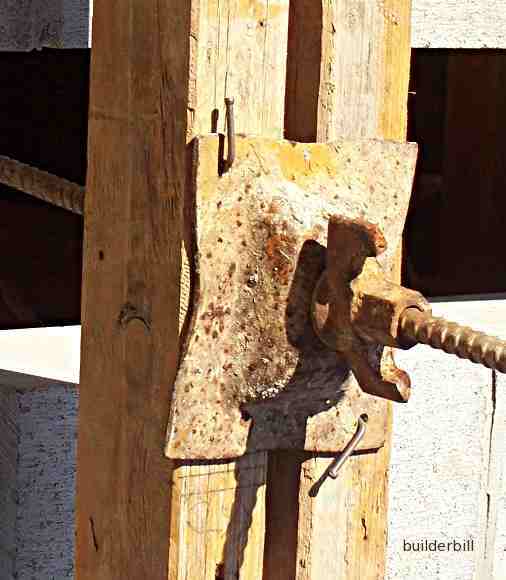 Normally used to hold wall forms together, these bolts are used to hold a column form together. One of the reasons for their popularity is their versatility. At the top of this column for there is one of these bolts fixed diagonally to pull some twist out of the form. When the bolts are used for walls, a PVC tube is cut to length and a polythene cone is fitted into each end. 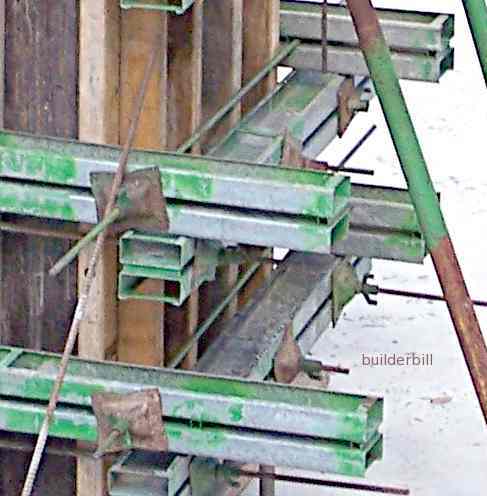 These spacers allow the bolt to go completely through the formwork. This system allows for walls of any thickness to be built, or even tapered walls. 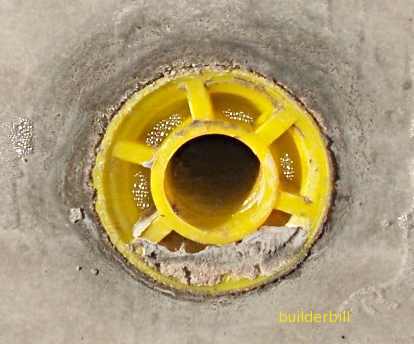 This is the appearance of the hole after the formwork has been stripped. The cone can be flipped out for reuse, and the hole patched with mortar of used again to secure another lift f formwork. A close up of the wing nut and washer. The fact that a lot of my photos show old rusty looking gear is not that it is of poor quality, but more that it is a testimonial that the equipment has been used an awful lot over a long period of time. For non glossary articles of a general and how to nature go to the formwork section on this site.